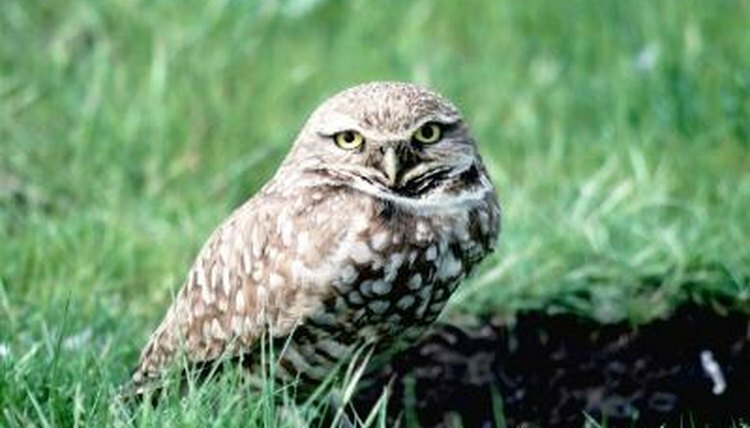 Burrowing owls (Athene cunicularia) are mostly terrestrial birds of the Americas. These diminutive and diurnal raptors, in line with their handles, do indeed sometimes dig out cozy nesting and resting spots for themselves -- when the soil is sufficiently soft. In most cases, however, they simply take over the burrowing work of other creatures, which are often prairie dogs, tortoises and pocket gophers. Burrowing owls are some of the tiniest owls around, usually tipping the scales at a dainty 6 ounces. Their plumage is predominantly brown, although it features white blotting. Other memorable physical traits of burrowing owls are lengthy limbs, vivid yellow eyes and small tails. Burrowing owls ears' are devoid of tufts. They are drawn to desert environments, and also to places with ample grass. They mostly dine on bugs, although they also frequently feed on decaying animal remains, birds, reptiles, amphibians and scorpions. Nesting for the species occurs underground in burrows. Males get the burrows ready by ensuring they are spacious enough. If they aren't, the males expand on them. They also adorn the edges of their burrows using roots, feathers, grass and sometimes even dried-out stool matter of horses and cows. When March or April comes around, female burrowing owls lay between seven and nine white, circular eggs. The mothers incubate the eggs for roughly four weeks. The white eggs turn brownish by the end of incubation, a result of dirt markings. While incubation is in process, the fathers-to-be are in charge of tracking down food. After the four-week incubation process, the youngsters hatch -- usually any time between March and July. Both of the parents work together to look after the little ones. The chicks, immediately after birth, lack hearing and are entirely dependent on their parents. The mothers and fathers rear the owlets as teams -- both offering food. The owlets usually can look for food themselves once they're 4 weeks old. They can fly by the time they're approximately 6 weeks in age, as well. Although burrowing owls care for their offspring for approximately 40 days, their owlets are pretty savvy when it comes to self-defense. When owlets sense the presence of predator threats nearby, they can closely replicate the sound of a prairie rattlesnake's rattle. By doing so, they can usually intimidate possible predators -- phew.